In this game we will try to come back you in the past. Your adventures will be in the antiquity. 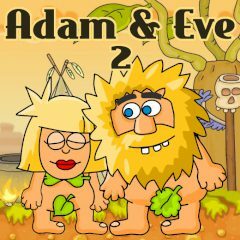 The main goal is to help Adam save his Eve. Follow the tips and you will reach your aim. Good luck! Have you ever visited the ancient world? If no, you have such a great opportunity now. You should help Adam to do everything to save his beloved, because Eve is in a real danger. In this skill game you just have to use a mouse. You should click on things you need and thus our hero will escape from each of the obstacles. Be very attentive, if you will not find the key to the level our protagonist can not escape and rescue the girl. You will meet so many barriers on the way, such as the bat, the rhinoceros, different birds and animals. Try not to make any mistakes and you will be a winner. Have much fun!